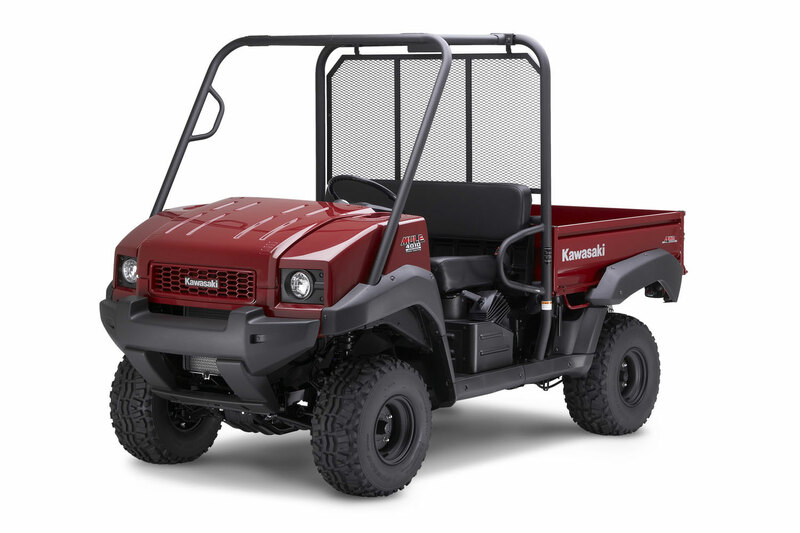 Already a proven performer with its reliable and robust diesel engine, automatic transmission, tilting cargo bed, and selectable four-wheel drive, the Kawasaki Mule™ 4010 4×4 Diesel utility vehicle now mates its muscular yet agile workhorse capabilities with an all-new rugged appearance. The truck-like look of this off-road performer belies the ease of handling made possible by its electric power steering (EPS). The EPS offers a more controlled ride by reducing steering effort at low speeds and harnessing its electric motor’s inertia to dampen much of the bump steer and kickback caused by impacts to the wheel. Electrically driven, the motor is controlled by an Electronic Control Unit (ECU) that uses input from a vehicle speed sensor and torque sensor to determine the amount of assistance provided by the system. This system works immediately after the engine is started, yet doesn’t create a power drain on the engine. The new bodywork on the Mule 4010 4×4 Diesel utility vehicle is similar in style to many modern pick-up trucks that are often working alongside the Mule. The body panels are durable, color-molded plastic that helps hide scuffing. The front hood of the Mule 4010 Diesel can be lifted with the pull of a dash-mounted knob to reveal a now deeper storage space, which also has convenient D-rings to secure cargo. Located beneath the front bumper are winch-ready tabs for an easy winch installation. At the core of the Mule 4010 4×4 Diesel is its liquid-cooled, 953cc three-cylinder diesel engine that produces high torque at low engine rpm. The diesel engine is matched to the Kawasaki Automatic Power-Drive System (KAPS). It’s a continuously variable transmission (CVT) that features a high and low range, reverse, and helps keep engine rpm in the most efficient range for any selected=”true”=”true”=”true” vehicle speed, load, or terrain. It yields a wide drive ratio spread for ample pulling power and quick acceleration. Large torque converters maximize belt engagement area and improve heat dissipation, boost strength and durability, and are aided by the use of a thick, strong drive belt and sheaves with high silicon-type material. The KAPS also features a high-flow cover helping to cool the CVT while providing superb splash protection and water-proofing. This reliable system uses a dependable, low-maintenance shaft drive to transmit power to a dual-mode rear differential that can be locked to maximize traction, or unlocked to minimize ground disturbance when making tight turns. The operator can also select four-wheel drive for extra pulling power in difficult conditions. The engine air cleaner is a cyclone-type Donaldson unit with a replaceable paper element. This efficient design needs less frequent cleaning, even with repeated use in extremely dusty off-road conditions. The 4×4 Diesel is equipped with a gauge that indicates when the filter should be changed. The Mule 4010 4×4 Diesel also possesses straightforward user-friendly controls. The high/low-range, forward/reverse shift and the four-wheel drive selector levers are all placed within easy reach on the dash. The coolant temperature warning light is easy to see, and a push-button control activates the headlights. Other standard features include an hour meter and horn on the dash and a fuel gauge on the gas tank. The chassis of the Mule 4010 4×4 Diesel is a ladder-type frame that rides on MacPherson struts up front and a DeDion rear leaf-spring suspension that work to carry heavy loads, stay light and maneuverable over rough terrain, and provide a smooth ride when the cargo bed is empty. Four hydraulically operated, self-adjusting drum brakes that are sealed to protect from water, mud and other debris provide stopping power, and 23-inch tires offer a comfortable ride and maximum traction over a variety of surfaces. 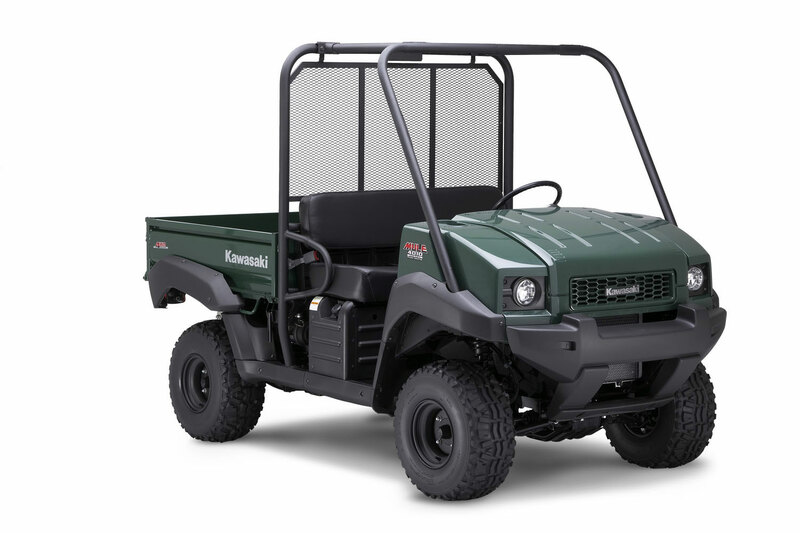 Other standard features include the large-diameter steel tube frame structure that meets federal Roll Over Protective Structure (ROPS) requirements, a 6.4-gallon fuel tank, spin-on oil filter and a U.S. Forest Service-approved spark arrestor in its muffler. The Mule 4010 4×4 Diesel utility vehicle can carry up to 1,100 pounds in its steel cargo bed and can tow up to 1,200 pounds with an optional draw bar. Other popular accessories include an enclosed cab, cab heater, snow plow, and soft or hard tops. These and many other Authentic Kawasaki Accessories are available through Kawasaki dealers. Rear suspension / wheel travel: Semi-independent, DeDion axle with leaf springs and shocks / 2.8 in. Cargo bed capacity: 1,100 lbs.